Motofil – Who are They? With a high number of companies across a wide range of industries investing in CNC plasma cutting machinery, we are going to be looking into why this is – urging more people and businesses to realize the many benefits that CNC plasma cutting machines offer. Let us look into this in more detail!!! The initial investment cost of plasma cutting machines, as with all other types of machinery, can vary dramatically depending on the specification required, i.e. 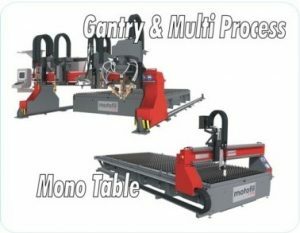 additional production enhancing features, such as a bevel heads, oxy fuel head, drilling & tapping unit, however, this being said, CNC Plasma thermal cutting machines are very cost effective when compared to other cutting methods available, such as Laser cutting machines, waterjet machines. Plasma cutting machinery operating costs are surprisingly low, typically costing approximately three quarters of the cost of a Fiber Laser cutting machine and half of the cost of waterjets. When choosing thermal cutting machinery factors in which people must consider include power consumption, consumables, gases and routine maintenance. Plasma cutting Tables and Gantry machines are fitted with CNC controls, most modern plasma cutting machines being able to work with a variety of toolpath files and advanced machine CAD drawing software, CAM nesting and optimisation software to minimise waste are common place. If you have any questions regarding plasma thermal cutting or would like to speak with a member of our experienced sales team, who will be able to advise what the machinery options are, based on your individual circumstances…….then please call 0113 236 3366 today.